The P-38J “Pudgy” is the name of the Lockheed P-38 Lightning multi-role heavy fighters flown by US Army Air Force Major Thomas McGuire Jr., the second highest scoring American ace of World War II. Since sitting on the P-38 for the first time in 1943, McGuire commandeered 5 P-38s, with each one carrying his signature silver “Pudgy” livery. It was, however, on the P-38J variant that the McGuire was best known for flying. Introduced in August 1943, the P-38J Lightning was a far improved version of the standard P-38, featuring increased wing fuel stores, bulletproof windscreen, more efficient engine cooling and improved speed and climbing abilities overall. These upgrades, coupled with McGuire’s legendary skill with the P-38, helped him rack up a total of 38 confirmed kills with his beloved “Pudgies”. 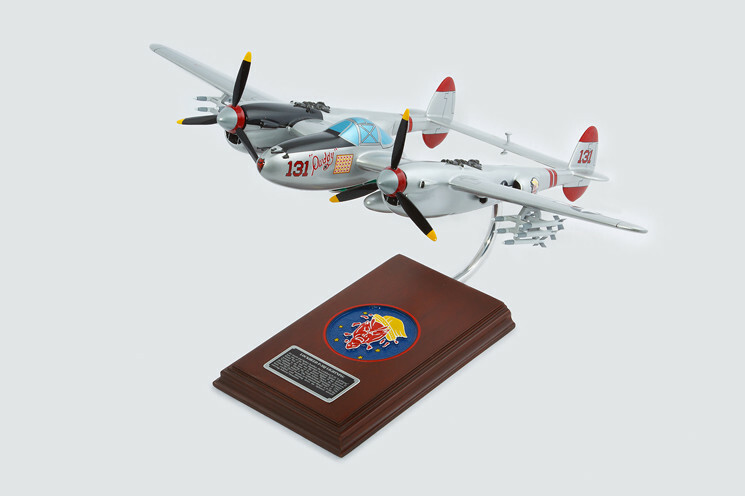 Maj. Thomas McGuire and his Lightning P-38 “Pudgy” are entrenched in the pantheon of America’s greatest war aces, and you can relive their glory with the P-38J Lightning (Pudgy) 1/32 scale model aircraft. Made from fine-quality wood, each desktop model is an accurate scale replica of the P38J Lightning used by USAF Maj. McGuire. You will not find a better quality aircraft model of this calibre at such a price. Get one today and you surely will not be disappointed.